Media is invited to these photo and interview opportunities on Friday, October 12 between 9 a.m. – 11 am. A United Way Suncoast representative will be on site during these hours. United Way Suncoast organizes this massive undertaking, perhaps the largest of its kind in the region, as part of its mission to connect the caring people of the community with opportunities to make a difference. 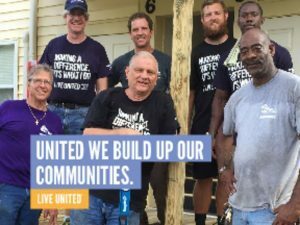 Through Day of Caring, local companies and organizations send teams to volunteer on projects that service agencies might not have the manpower or resources to afford. Tasks to be completed run the gamut from creating computer network systems to painting and gardening, and from refinishing furniture to cleaning and organizing. United Way Suncoast Young Leaders’ Society is helping support the community with Night Out for Caring on October 11 at Bar Louie in International Plaza, Tampa. The social event promotes area volunteerism and will feature four nonprofits seeking volunteers. *The Independent Sector, a leadership forum for charities, foundations and corporate giving programs, calculated the value of a volunteer (April, 2018) at $24.69 per hour. United Way Suncoast fights for the education and financial stability of every person in the community through educational programs that give children the skills to succeed, help adults achieve long-term financial stability, and activating caring individuals through volunteerism. We are proud to serve the people of DeSoto, Hillsborough, Manatee, Pinellas and Sarasota counties by operating and funding services and programs to help create a stronger, more vibrant community. In 2018, United Way announced a collaboration with Saleforce.org as the exclusive providers of Salesforce Philanthropy Cloud. To find Suncoast-area volunteer opportunities, visit www.volunteersuncoast.org. For more information, please call 941.748.1313 (Manatee office), 941.366.2686 (Sarasota office) or 813.274.0933 (Tampa office), or visit www.unitedwaysuncoast.org.